When applying for a Georgia Driver's License or Instructional (Learners) Permit, most first-time applicants must take and successfully pass a Knowledge Exam consisting of a Road Signs and Road Rules test. All information necessary to pass the test is included in the Driver's Manual. 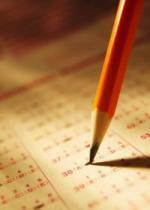 Test your knowledge with the DDS Practice Test. This practice test will provide an idea of the type of questions that will be asked. The GA Department of Driver Services does not offer CDL Practice Test; however there are many companies on the Internet that offer this service. Please use your favorite search engine to find a CDL Practice Test.